When Speak from Here to There was published in 2016 it was, remarkably, doing something quite new. There are of course the conversations implied in the poems of Coleridge and Wordsworth, but no two poets had committed to, in the words of Will Harris, the almost daily "structure of call-and-response, each utterance is filtered through the other." This richly multi-layered dialogue arises from responses to each poet's public world, to the private worlds of family, to the inner world of wondering how one can write "love poems in a time of war, these times of monstrous beasts," and from the stimulus of the other's poem arriving in the e-mail in-tray. Though both poets express their anxieties about the limitations of the prophetic, there is the countervailing witness of their immensely fertile imaginative response to each other's words and the comfort that "On the road, you long for the like-minded" is a longing that is being fulfilled. 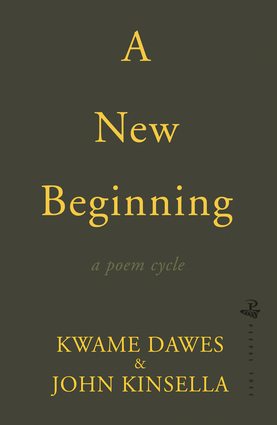 Kwame Dawes is a professor and writer of poetry, fiction, nonfiction, and plays. John Kinsella has published many books of poetry.